GP New SIM 9Tk 1GB 7 Days Internet Offer 2019 (Total 9GB)! Grameenphone’s new prepaid SIM 1 GB internet is only 9 Taka. The 9 Tk 1GB internet validity is 7 days. The offer will take up to 9 months at most once per month, with the month of starting the GP new connection. Grameenphone’s new SIM price is only 100 Taka, you will probably be given number 013 series. So to find out more about the offer please follow the below given description. 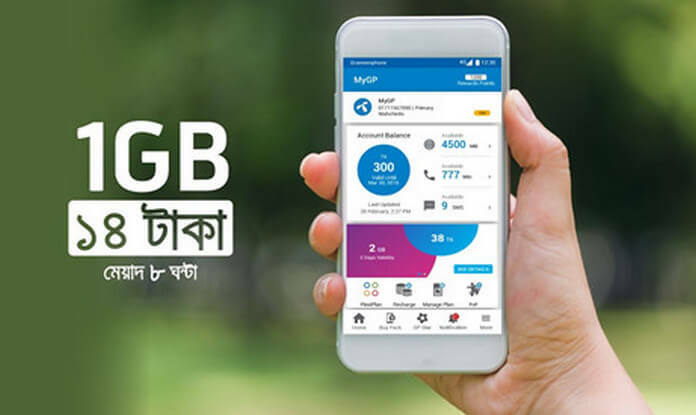 Grameenphone new prepaid sim user can claim this offer. Dial *121*1*4# to check data balance. Please dial *121*1111# (free) to know the remaining options for each month. To enjoy the offer at 9 Taka, you will have to recharge only 9 Tk. There is no code to activate, only the offer can be taken by recharge. You can also check your sim all information from MyGP app. If you like our website, please like our official Facebook page.